Australian Newspaper Republishes Controversial Cartoon of Serena Williams - Integration Through Media ....! 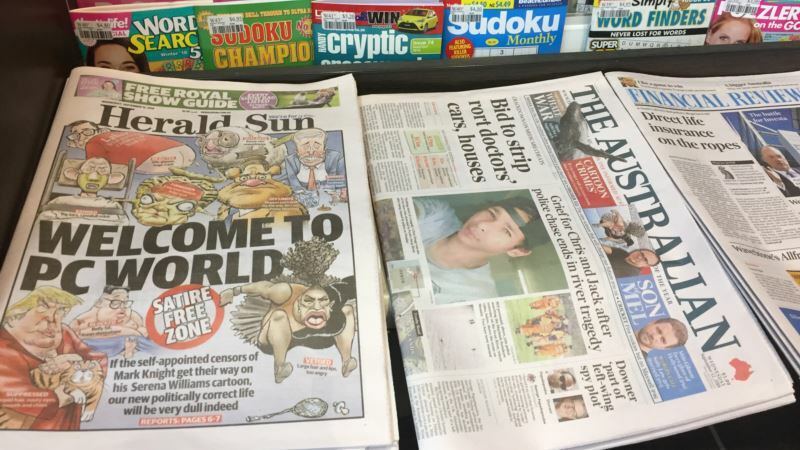 (VOA): An Australian newspaper republished a controversial cartoon of American tennis great Serena Williams, defying widespread accusations it is racist. The cartoon lampoons Williams's heated dispute with umpire Carlos Ramos during her loss in last week's U.S. Open women's final match to rising star Naomi Osaka. Ramos warned and penalized Williams for three rule violations, including smashing her racket on the court. The cartoon attracted anger over Knight's depiction of Williams as a large woman with oversized lips, calling it a stereotypical portrayal of black women. “If the self-appointed censors of Mark Knight get their way on his Serena Williams cartoon, our new politically correct life will be very dull indeed,” the paper said in an editorial. Knight said the cartoon was about Williams's “poor behavior on the day, not about race.” But he was also criticized over his depiction of Osaka, the child of a Japanese mother and Haitian father, as a slender blond woman. Knight posted the cartoon on his Twitter account Monday, but has since disabled it after attracting tens of thousands of comments, most of them critical.